From the cute and the cuddly to the wild and fierce, animal themed games are a popular choice for software developers. Using animals as major characters means games can be bright, light-hearted and entertaining, with plenty of room for developers to use their wildest imagination. Pokies featuring animals constitute some of the most popular games at leading casinos and we’ve come up with an overview of our favourite slot games for animal lovers. One of NetEnt’s finest offerings to date, Spiñata Grande is an animal themed game of a different kind. Spiñata Grande is full of crafty piñata critters which are absolutely bursting with colour and attitude. There’s the zany donkey, Tropicana toucan, fiery bull and the hat-wearing moustachioed fish. If you want bright graphics and good times aplenty, Spiñata Grande ticks all the right boxes. 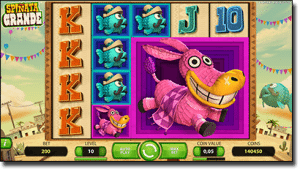 Set against a dusty Mexican backdrop, this unique pokies game features supersized Colossal symbols, free spins and a mini-slot bonus game. 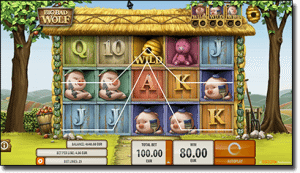 A combination between an animal themed game and a classic fairy tale, Microgaming/QuickSpins’s Big Bad Wolf pokies follows the story of the three little pigs who build their houses out of straw, sticks and bricks in an attempt to be safe from the big bad wolf. The game uses soft, pastel colours and cute animation to create the fairy tale atmosphere, with winning symbols that blow out the way to form room for new ones as part of the Swooping Reels feature. There’s a handful of bonus features including the Blow the House Down bonus which awards free spins and the Pig Wild feature which turns a pig symbol into a wild every second win. This famous Microgaming pokies game has been around for years now, so don’t expect the same ground-breaking graphics that you’ll get from these other games, but if what you’re looking for is a life changing win then you’ve come to the right place. 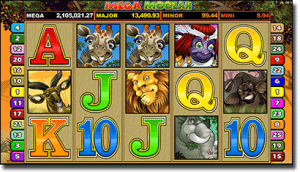 Mega Moolah is arguably the Internet’s most popular progressive jackpot pokies game and has been responsible for creating a collection of multi-millionaire winners over the years. It follows an African safari theme, set against a desert landscape that’s full of iconic African animals like lions, giraffes and elephants with a kind of Lion King vibe to the graphics. Being a progressive jackpot game, real money bets are required to play Mega Moolah. 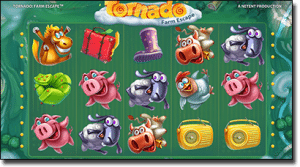 It’s a frenzy on the farm as a wild tornado blows into town and the animals aren’t locked up in time, sending all the local farm creatures flying across the reels. With a toe-tapping country music soundtrack, watch as cows, pigs, sheep, chickens and household objects swirl around the screen in the hopes of landing on a juicy win. There’s a bunch of huge bonus potential here, with a Tornado Feature triggered by hot and cold symbols that results in the tornado whirling around collecting all active and wild symbols. NetEnt has created another winner here, using quirky animal characters that make for entertaining gameplay. 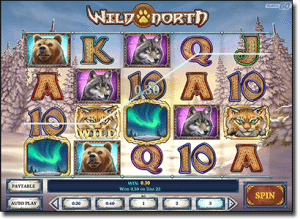 Play’n Go’s Wild North pokies takes players to the rugged Canadian mountains where the animals are fierce and mysterious. Peering out of the snow are striking owls, bears, wolves, stags and wild cats, set against an icy forest. An appearance of three or more of the stunning Northern Lights scatter symbol will trigger the bonus wheel, awarding one of seven unique bonus games including free spins, the Wild North Explorer, Return Images and Final Images. Wild North is for those with an equal love of the wilderness and big wins. Dog lovers beware, you’ll be so strongly sucked in with the puppy dog eyes of BetSoft’s 3D animation that you’ll forget these dogs aren’t real. Set in a pet store, this bunch of adorable puppies are waiting for their forever home, breaking into dances of joy when a winning combination lands. 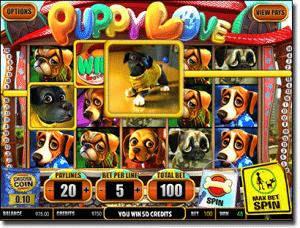 Puppy Love pokies has wilds, scatters and a Puppy Store Bonus Game that’s activated by the appearance of two or more For Sale signs across an active payline. For animal themed games, we recommend checking out Raging Bull Casino, our top-rated casino site for players from United States, which has hundreds of real money pokies to choose from, all available for instant-play with no downloads required.